The acts of love described in these songs range from the heroic work of family carers, simple humanity and narcissism to the everyday magic of loving relationships. Following 2010's 'More To Be Revealed' and 2015's 'A Long March Home' Mike's latest effort sees him further expand his sound by infusing his unique brand of folk with a jazz sensibility which incorporates neat time changes and brass swing. Nevertheless Mike's greatest strength lies in his lyrical astuteness, a prime example of which is album opener '24/7 Care'. It's an ode to the army of unpaid and unsung carers who tend to relatives for scant reward or recognition. It marries a jaunty tune with a sombre subject and I'd compare Mike Reinstein to Ray Davies in his ability to find beauty in adversity and then paint a picture with words so the song becomes an almost living entity. Sincerity is also a quality 'Acts of Love' possesses in abundance. On the Simon and Garfunkel-esque 'It's Come To This' Mike's delivery is heartfelt and is evidenced by a slight quaver in his voice; that's the kind of touch that can't be faked. This disc ebbs and flows nicely as tracks like the upbeat earworm 'A Lot Like You' punctuate the album. Both 'Act of Love' and 'I Love Everything You Do' are very evocative and bring to mind late night bars on rain sodden streets. Sandwiched betwixt is 'Everything's Going My Way' a lively ditty dedicated to everybody's favourite narcissist, Donald Trump. Mike is part of the diverse Brighton music scene and Ali Gavan, from local punks Cockwomble adds some vocals and instrumentation in addition to providing a clear production. It may seem that punk and folk are polar opposites but only superficially: both are great vehicles for protest as evidenced by the Middle Eastern flourishes which encase a heart-wrenching tale in 'The Gardener Of Aleppo'. 'Seaford Song' is a bittersweet note to a youth that'll never return while 'Dear Mr. Beckett' is almost a love letter to Samuel. The subject of death is dealt with in a dignified, defiant manner on album closer 'On Our Way' and it makes the silence that follows when the disc stops spinning even more poignant. Varied, but not to the point of eclecticism, 'Acts of Love' incorporates many moods and shades that presents each song like a Polaroid. Essential listening for folk fans or, indeed, music fans in general. Mike fashions all his carefully-composed and appealingly literate 12 tracks, from the swaggering blast of '24/7 Care' through the sad, desolate break-up of 'It's Come To This'; the quiet, lazy jazz of the title track and 'I Love Everything You Do', sweet memories of innocent teenage years outlined in 'Seaford Song', to Mike throwing into sharp focus the 17-year-old son caught up in the Syrian civil war and the deadly barrel bombs ' both Russian and the dictator Assad's ' in 'The Gardener Of Aleppo'. His voice is both warm and melodic, and his sound, invigorating musicianship just flows like an endless river, tempting and luring you to still linger awhile and revel in his world. What's not to like? Oooh what a lovely record. (Not the most journalistic of openings but isn't that how we all feel when we hear something unexpectedly beautiful?) This is Mike's fifth album but the first time I've heard his motley, clever and engaging songs which range from melodic jazz strums to lilting finger pickers and not a duff one among 'em. Opener '24/7 Care' is a wonderful surprise sung in tribute to carers who spend their days looking after loved ones but set to a choppy sixties pop beat, brass section and all. This is an album dedicated to that eternal medicine, love, with a nod to Che Guevara's lovely quote (I nicked this, aptly from the sleeve notes to anarcho-punk band Crass's album Acts of Love) ' At the risk of seeming ridiculous, let me say that the true revolutionary is guided by a great feeling of love.' The accompanying band is great - why sit there strumming alone when you can add these lovely touches of colour and depth? Mike's songs are mostly stories well told and carefully sung - stories that balance between narrative fantasy and the up-to-date everyday around us, with cameo appearances from Peggy Lee, Samuel Beckett and Billie Holiday. They say first impressions are the most important so any album whose opening blasts remind me of a slightly whimsical Waterboys, a folky take on Squeeze, or a more coherent John Martyn has to be applauded in catching my interest from the get go. The brassy stomp of 24/7 is a great way to intrigue and entice and by following it with the very delicate and restrained It's Come to This you immediately get an idea of the sonic scope and lyrical imagination of Mike's repertoire. But it isn't just a case of mixing up the dynamic or the volume, as the album progresses it wanders through a number of styles and genres too. Everything's Going My Way is a cool, up tempo, up town, jazz-soul groove, It's a Given is a chiming and shimmering beautiful slice of folk and The Gardener of Aleppo is a raw and skittering Appalachian rootsy blues piece. The art of writing across so many styles is to not to sound too scattered and disjointed and Mike's ability to skirt around many different genres yet make them fit together into a cohesive piece of work is joy to behold and speaks not only to his ability to travel the musical landscape playing by his own rules, but perhaps tells us just how pointless generic labels are in the first place. Throw in plenty of gently humorous turns of phrase, poeticism and personal insights, not to mention some beautifully poignant moments, world thoughts, literary references and even, quite unexpectedly, Andre The Giant and you have a wonderful collection of deft and dexterous acoustica. What more can you ask for? ...Mike sings well, plays excellent acoustic guitar and is joined by a more than competent group of musicians. I especially enjoyed the jazzy stuff - the title track, which for some reason put me in mind of The Blue Nile and I Love Everything You Do, a conversation between Peggy Lee and Billie Holiday which trumpeter Robert Heasman transforms into the epitome of cool. Recommended. A brilliant CD of the week! This is an album that oozes class and quality from beginning to end. The songs tackle difficult issues and portray them with a great deal of skill and lightness of touch. It's a master class in sympathetic songwriting. If it isn't in my list of CDs of the year, come the end of 2018, I shall be mightily surprised. A musical gem! Quotes from Roger Williams, the presenter of his acoustic/folk programme, A World of Difference. It is a given that we can never get or give enough love, or show enough. And thus an album called Acts Of Love should clearly be manna from heaven for this reviewer, and thus be just what the doctor ordered. And let me say that lest your definition of the word love be too narrow, this album runs the gamut of the emotion. Its subjects range from the opening track - 24/7 Care ' on that noble breed of heroes called carers, to the final track On Our Way where, if things go to plan, one has come to love one's impending death, and learned to see it as the start of a whole new journey. En route we encounter I Love Everything You Do (the unabashed love of an artiste for another's work); The Gardener Of Aleppo (a hymn of praise to the well documented love of that doomed gardener in Aleppo who moved us all on our televisions with his love of mankind and fantastic stoicism and lack of bitterness); and Dear Mr Beckett (with the little known story of Samuel Beckett's compassion for a neighbour's child who suffered from gigantism and prejudice: a child who later became Andre The Giant, the famous wrestler). I've always found that a good opener is almost guaranteed to keep you listening, even if the title utilises one of Oxford University's top ten most irritating expressions. 24/7 Care is simply a beautiful pop song celebrating the most important people in our society, those who care for us, all wrapped up in an arrangement of a Ray Davies standard. It's actually such a good opener that you tend to stall getting on to the second song. It's important though that you do though, otherwise you just might miss The Gardener of Aleppo, a poignant comment on war, from the perspective of a thirteen year-old Syrian boy, lamenting the death of his father; a simple song, delivered on ukulele, but with an extraordinarily powerful message. Acts of Love is Mike's fifth album to date and is one of those albums by a singer songwriter who cares, in that he cares about the songs that he writes, making sure there are no throw aways. Pick any of the songs here and it will mean something to you; whether it's the lazy lounge jazz arrangement of the title song Acts of Love, or the joyful optimism of Everything's Going My Way. Then there's Seaford Song, which recalls a holiday when 'Little Eva sang on the house PA' to a thirteen year-old Mike Reinstein, which further references some of the most important names of the era, Stevie, Marvin, Martha and Sam and Dave, no prizes for guessing who Mike's referring to here. If this wasn't enough, this latest collection of songs includes a gorgeous tribute to Billie Holiday, from the angle of a young fan by the name of Peggy Lee, set to a melody based around Strange Fruit, Holiday's most poignant song. I Love Everything You Do is a highly accomplished song, which really should be recognised for what it is, a song written almost definitely as an act of love. Mike Reinstein is a singer/ guitarist from Sussex and his songs are usually literate, thoughtful and, indeed, thought-provoking. I'm pleased to say that Acts Of Love is no exception. The album title itself is cleverly open to interpretation but the opening track leaves us in no doubt as to Mike's message. '24/7 Care' is a big production number featuring Robert Heasman's trumpet and Tim Wade's trombone over producer Ali Gavan's bass and Lee Humber's drums. Its subject is the family members who take over the caring duties that the government should provide and it reminds me a bit of the early Kinks. The style changes to acoustic guitar for 'It's Come To This' which, I've decided, switches the viewpoint to a carer isolated by his duty to his wife. It's desperately poignant and makes a perfect contrast with the optimism of '24/7 Care'. Fortunately for our emotional balance, things become less fraught with 'A Lot Like You' and the jazzy, smoochy 'Act Of Love' featuring Reina James-Reinstein's piano and electric guitar from Mick O'Connor. Now, of course, I'm looking for the twist in the tail and 'Everything's Going My Way' sounds like a silly, inconsequential song until you reach the end and'no, I'm not going to spoil it for you. Other songs range from an imagined meeting between Billie Holliday and Peggy Lee to life in modern Aleppo and a memory of Samuel Beckett and Mike returns to the main theme with 'It's A Given' decorated by Ray Knight's harmonica followed by the nostalgic 'Seaford Song'. 'Show Me My Mark And Tell Me What To Say' is a romantic piece with a country edge and the whole band back together again. Acts Of Love is another fine album from Mike ' a heady mix of subjects and styles and all done with love. 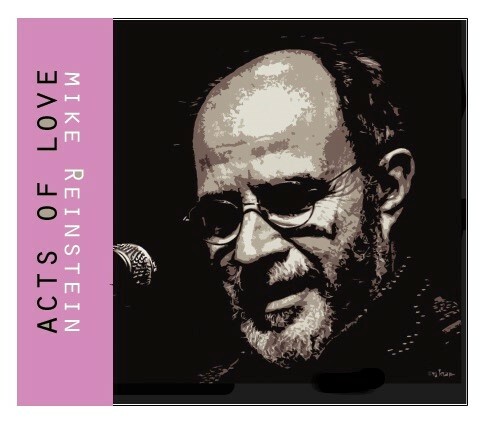 Acts of Love is the third album from Mike Reinstein for Irregular Records, and sees a bit of a departure for him musically. While you still get his characteristic brand of intelligent folk, he's introduced more of a Jazz-flavour here and there, most noticeably on the title track. The art of storytelling is still front and centre however, honed through writing and performing since the 1970s, though his path has also taken him through jobs delivering false teeth, cold-calling sales roles, and a dramatherapist working on acute psychiatric wards. The opening track sets the tone perfectly for what follows. 24/7 Care is an up-beat track about families caring for loved ones, and being forced to do so by the inaction of the government. Lyrically there is a playfulness on display, as indeed there is on so many of his songs, with the musical accompaniment designed to highlight the message. Of course having written so many songs for children over the years (The Tommy Tomato Songbook and The Blewdle are well worth checking out), it's no surprise to see him having fun with the lyrics, and his love of language shines throughout the album. The album is well named, with a lot of love laced through the tracks. The Gardner of Aleppo is the story a thirteen year old Syrian boy grieving for his lost father, simply sung but wonderfully haunting. There is a tribute to Billie Holiday from Peggy Lee, Samuel Beckett taking Andre The Giant to school, and the alarming narcissism of Donald Trump. Seaford Song is a sepia-tinted song full of nostalgia, which also throws out some familiar names. A Mike Reinstein album is always worth a listen, and Acts of Love is no different. Wonderfully written and performed with real love, you can feel the warmth pour out from every note. Every story is captivating, and his lyrics display a deft touch and a sense of fun, while retaining a shrewd insightfulness that while make you think. Warm and full of heart, Acts of Love is a lovely album, and one you'll return to again and again.